Are there any trees that prefer to grow on the floor of water bodies but protrude to the air? Are there any trees that prefer to grow on the floor of water bodies but protrude to the air? Specifically, those that prefer salt water or grow on shallow sea. 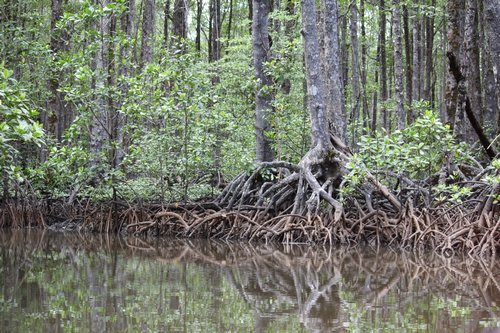 Mangrove swamp trees and shrubs immediately spring to mind. There are many species that fall into this category of trees that grow in intertidal and costal locations. They prefer locations where salt and freshwater mix, known as 'brackish water'. All roots require oxygen and the species that fall into this category have developed roots that protrude above the surface, called pneumatophores. Not the answer you're looking for? Browse other questions tagged botany trees or ask your own question. Why is it beneficial for trees to grow that tall? Why are there no tree-like plants that grow in lakes? Why are there no trees in Texas? Are there terrestrial plants that thrive on sea water? Do trees grow from the bottom or the top, or is that oversimplifying?